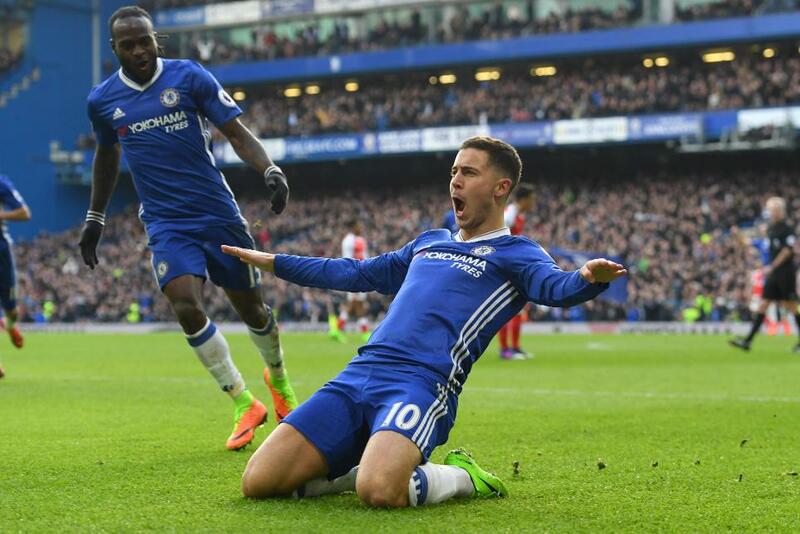 Eden Hazard scored a stunning goal as Chelsea hit Arsenal’s dwindling title hopes with a comfortable 3-1 win at Stamford Bridge. After an open start, Antonio Conte’s team took control from 13 minutes when Marcos Alonso followed up after Diego Costa’s header hit the bar. Chelsea were on the front foot, although Gabriel could have equalised but headed too close to Thibaut Courtois just before half-time. Hazard doubled Chelsea’s lead on 53 minutes with a mazy run from his own half that left Arsenal’s defence in confusion. Cesc Fabregas came on to add a third on 85 minutes, capitalising on Petr Cech’s poor pass, while Olivier Giroud got a late consolation for Arsenal. The win extended Chelsea’s lead over Arsenal to 12 points, although second-placed Spurs reduced their league advantage to nine points later in the day.